This week, Visit Orlando celebrated National Travel and Tourism Week by announcing a record number of visitors to the city, and by setting a Guinness World Records™ title. The organization, which promotes tourism in the Orlando area, announced a record 68 million travelers visited our area last year. 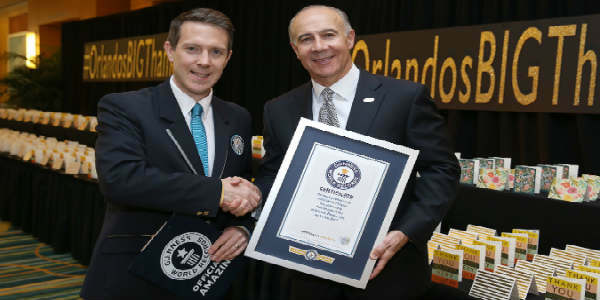 Visit Orlando unveiled its new milestone visitation number by setting the Guinness World Records title “Most greetings cards collected in 24 hours” during a gathering of more than 900 members of the tourism community. As a way to say thank you to Orlando visitors in 2016, the Orlando tourism community came together to handwrite 3,144 thank you cards for #OrlandosBIGThankYou. This new campaign will run through the remainder of the year to thank millions of guests for their support through hand-written cards, Visit Orlando’s social media channels, marketing communications, destination websites and member programs. I can’t wait to see what records the Orlando area sets for 2017! Thank you to all who help make this city a destination worth visiting!